Kirk Cousins threw a 63-yard touchdown pass to DeSean Jackson and scored on a quarterback sneak, Washington intercepted Eli Manning three times, and the Redskins held on to beat the New York Giants 20-14 Sunday, pulling into a tie for the NFC East lead. 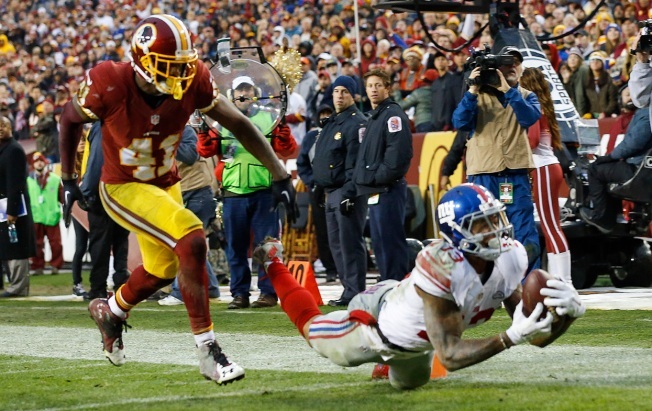 The Redskins and Giants are both 5-6. The Philadelphia Eagles (4-7) and Dallas Cowboys (3-8) are the other members of the mediocre division. It was the 20th three-interception game of Manning's career. Trailing 20-0, the Giants made it close when Manning threw fourth-quarter TD passes of 40 yards to Rueben Randle and 21 yards to Odell Beckham Jr., who made a fantastic diving catch, corralling the ball with his left hand while parallel to the ground.